Niosh (USA) has developed a cough simulator to study how diseases like influenza can spread via airborne droplets. This simulator uses Kvaser’s CAN-based Leaf Light HS v2 interface. At speeds of up to 80 km/h, the human cough is a powerful mechanism for expelling liquid from the lungs. The problem is, it is also an efficient means of spreading disease, which is why simulating human coughs and sneezes is a lively area of scientific research, and one in which CAN has found a role. Bill Lindsley and colleagues from the National Institute for Occupational Safety and Health (Niosh), within the US Centers for Disease Control and Prevention, have developed a cough simulator. The simulator operates in a controlled environment, to study how diseases like influenza can spread via airborne droplets and test the efficacy of different protective measures. In a paper entitled ‘A cough aerosol simulator for the study of disease transmission by human cough-generated aerosols’, Lindsley and his colleagues describe their mechanical cough aerosol simulator in detail. CAN is used to communicate between a linear motor from Copley Controls, which drives the stainless-steel bellows, and a computer. CAN is ideal for situations in which a greater distance may be required between the computer and the motor control, as in the case of this system where the control system sits outside the test chamber. The simulator uses a CAN-based Kvaser Leaf Light HS v2 interface recommended by Copley. The Leaf Light HS V2 is a high speed USB interface for CAN that offers loss free transmission and reception of standard and extended CAN messages on the CAN network. In this application case it connects the motor and the computer, transmitting control commands from a custom built National Instrument’s (NI) Labview program, and sending back motor position feedback. 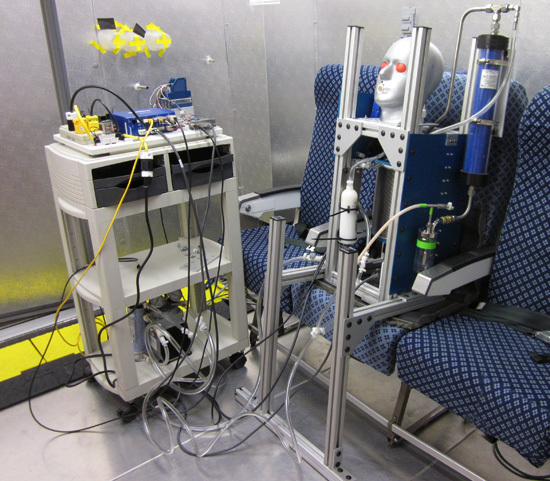 Whilst the initial cough simulator was designed to simulate the dispersion of cough aerosols in a medical examination room, the latest version of the device replicates an aircraft cabin and Lindsley’s research explores how to isolate someone who is developing symptoms of a disease such as Sars or pandemic flu. For the frequent travelers, you may be interested to know that this research is leading to development of a foldaway curtain for use around ‘at risk’ passengers, at least for US aircraft. The Ethercan gateway by Kvaser (Sweden) enables CAN monitoring in container port cranes.